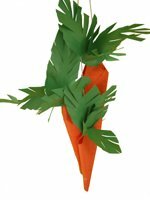 Our Easter Party Decoration Ideas will make your party that much more unique and festive. We've got lots of do-it-yourself ideas that will make your Easter party memorable! 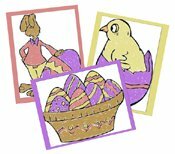 • Kids are always excited about an impending party; get them involved in the decorations by having them color Easter Coloring Pages to hang around the house. Make them look framed by putting a piece of colored construction paper behind them and hang on the walls and windows! Start doing this a few days or week before the party, it’s a really inexpensive decoration and helps to focus all that “pre-party excitement.” Use our FREE printable Easter coloring pages from our sister site. • Before you buy anything at the store use what you have around the house. Stuffed bunnies can be used to decorate a mantle or table. What about your Easter Baskets? Fill them with plastic eggs and candy and use as a fun centerpiece. • Make a large Easter basket with an empty cardboard box. Paint it pastel colors. Use a strip of cardboard and staple to the box to make the handle. Buy a bunch of Easter grass and fill it up with eggs, trinkets and treats. You can set this inside the party area, or outside for your guests to see as they arrive. • Have a basket full of bunny ears at the front door for your guests to put on as they enter the party. You can make your own using a band of construction paper and two bunny ears stapled or glued on either side. Check out our funny bunny hat, or have a look for some at your local discount department store. or this eco-friendly homemade sidewalk paint (the chalk will easily smear when walked on, we recommend the paint). • Make homemade Paper Ribbon Decorations to hang below windowsills, porches and the balcony. Use green, yellow, purple, pink or white paper. • Make some easy Easter Bunny Napkin Holders with paper tubes and construction paper! • If you’re a little more adventurous these inexpensive chick napkin holders are super cute AND your guests can take them home after the party! • Make your own table confetti by using a hole punch and pastel paper. • You can buy Easter-theme plates, cups and napkins. Or just buy solid color and use other table accessories to “Easter up” your table!